The Dormouse is one of Britain's most endangered mammals. This is because much of its habitat of deciduous woodland and hedgerows has been lost. Competition by Grey Squirrels for food may also be a contributing factor. This small attractive woodland rodent is mainly nocturnal. It is arboreal, spending its active time in shrubs and trees where it searches for food. Its diet consists mainly of fruit, berries, flowers and insects. In the autumn hazelnuts can be a very important source of food as they have to build up their fat reserves as they hibernate overwinter. In fact the Dormouse can hibernate for as much as three quarters of a year if the weather is bad. They hibernate on the ground, rolled tightly into a ball in a nest of leaves and grass. Their body temperature and heart rate are lowered and they become torpid and cold to the touch. Hibernating enables them to survive by "shutting down" during cold weather and they can even do this in spring or summer. Thus they have long periods of inactivity which probably contributes to the long life span of 5 years. Dormice breed once or twice a year usually producing 4 young which are independent in about 2 months. Their nest are often built of grass interwoven with honeysuckle. The nests can be anywhere from a few feet above the ground in brambles to high up in the forest canopy. Their colour is light brown with furry long tail and prominant beady eyes. Dormice are found mainly in the south of England particularly in Devon and Somerset. Other favoured areas include Kent and Sussex with sporadic populations elsewhere. They are largely absent in the north of England. Dormice are protected by law and you may not even handle one without a licence which is available from English Nature. Dormice like to eat hazelnuts and if you examine a hazelnut shell it is possible to tell for certain whether it has been eaten by a dormouse. Look at the picture of the hazelnuts on the left. Both have been eaten by Dormice. The characteristics are a neat smooth circular cut to the inside of the opening and tiny radiating teeth marks on the outside. 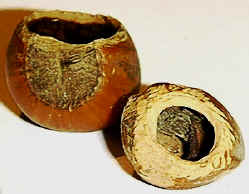 Woodmice also like hazelnuts and eat them in a similar way but the inside of the cut shell is not smooth as woodmice gnaw across the cut. Squirrels just crack the nuts open with their powerful jaws. So remember, a smooth circular cut with tiny radiating teeth marks is the sign of the Dormouse!